HALLOWELL -- The $4 million Bank of Maine Ice Vault is on track for a June opening. HALLOWELL — The $4 million Bank of Maine Ice Vault is on track for a June opening. 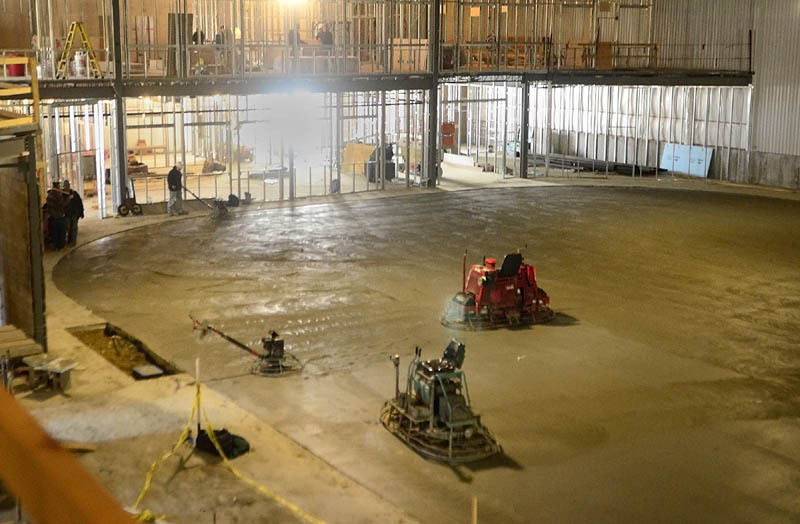 On Wednesday, workers poured a layer of concrete over refrigerant pipes to form the base of the new rink. Work has been ongoing for more than two months. The roof is nearly finished, and most of the work that remains is interior, such as installing elevators and stands, Johnson said. Johnson said that Preferred Mechanical Services, which is handling the refrigeration, and Blane Casey Building Contractor are working well together and are keeping plans on schedule. Johnson also is working with the Skating Association of Maine to schedule and organize summer programs such as public skating, camps for hockey and figure skating, basic skills lessons and youth hockey leagues. The association will be holding early registration for 2012-13 youth hockey Saturday at Sparetime Bowling, 215 Whitten Road, Hallowell, from 11 a.m. to 1 p.m. The old Kennebec Ice Arena, built in 1973, collapsed under the weight of snow on March 2, 2011. The Bank of Maine, with headquarters in Gardiner, contributed toward the new arena and secured naming rights. Construction of the new rink is being overseen by Blane Casey Building Contractor Inc., of South China. The new arena will include two floors, conference and function rooms, updated locker rooms and a mezzanine or viewing platform at either end that can be accessed from the bleachers. The tax break that helped finance construction of the new arena will go to the City Council again, this time for a procedural vote early next month. “In no way should it change the outcome that has already happened,” City Manager Michael Starn said. When Department of Economic and Community Development staff were reviewing the city’s tax increment financing agreement with arena owner Peter Prescott, they realized that public notice of a hearing on the tax break was published only six days before the hearing in September. State law requires that 10 days’ notice be provided. A city employee made a mistake when placing the ad, Starn said. Under the tax deal, the city will reimburse taxes on the value of the building over the first 10 years of its existence, saving $612,000. Starn said City Council acted in good faith when holding the hearing and voting on three separate readings of the TIF agreement. He noted that the council chambers were full to overflowing at the hearing, and several people testified both for and against the TIF. At their regular meeting on Monday, May 7, the City Council will hold a public hearing and vote on a motion to reaffirm its approval of the TIF in September.